Professional letters of recommendation concerning Collin’s conducting experience are easily available upon request, which are not included herein. Collin loves to conduct and teach. Whether by the baton or bow, Collin seeks to instill a fun learning experience which stimulates further ideals for growth. He enjoys celebrating accomplishments, and providing examples of the work required for a creative path forward. Musicians he has worked with have expressed fond memories expressed below, which have been sincerely appreciated. The concert was amazing!!! All my families and friends were so impressed and that they kept telling me what a excellent performance it was! Although I have heard the music many times---You can tell that every week I really enjoy sitting in the back of our rehearsal room listening ----I was still thrilled by the concert. I really feel the power of the orchestra, which magnifies the power of a single piece of music thousands times, brings me to a fun and magic world. I am so proud and feel so lucky that Maggie is in this excelled team and I want to thank you and the whole team for all the help. I can see the changes in Maggie during the past 3 months. WCYO inspires her interest in classical music. We used to listen to the random music station on the car. After she joined WCYO, Maggie ALWAYS turns on to All Classical Portland and listens to the classical music and orchestra performance. WCYO also gives her confidence. As I said before, she is extremely shy and "is not good at communicating with people" (Maggie's words). Her hobbies include painting, reading and piano which was done by herself. Now she is learning how to fit into a group of youth, adults and seniors. She was a little bit nervous when she was invited to the cello group practice at Phyllis' house. Later she told me that cellist group gave her so many suggestions and encouragement and she enjoyed the practice very much. WCYO even gave Maggie the free summer lesson opportunities. What a surprise to us! Michael talked to my husband, sent me the application and followed up with me to make sure the form is correctly filled in. He is such a kind person. I am glad I sent WCYO an email 3 months ago and I appreciate that you gave her a try at that time. Thank you for the tips of organizing the music before the rehearsal and helping to make sure she had stand light and tuning the cello before the concert. We are looking forward to our 2017-2018 program season! Nice note to the orchestra. I thought it all went very well. Thank you for doing such a great job, especially with all the extra work that went with the soloists. There was a great deal of positive discussion at the board meeting Tuesday night about this concert, and I thank you all for your contribution. You helped to make it a fun and memorable event, especially for our soloists and audience. Personally, I consider it a gift to us. Trust is the key, and I sensed that once we began to trust your lead, and you began to trust that we would follow, everything started to come together. Well done! I wanted to let you know how much everyone appreciated the work you did with us yesterday. Everyone was really impressed! One of our new people told me after the rehearsal: “I really like this director!” And when we were all hanging out at the pub afterwards we all agreed this was the best and most productive rehearsal of this cycle. Your time management, the musicality (and clarity of the beat) you brought to both the Brahms and the Franck, the helpful notes, that was all very well done. I'm Alexa's mom and I want to thank you so much for another beautiful concert! You have created a wonderful orchestra and your passion and vision have ignited and inspired not only all the performers but the whole audience! Thank you for including The Messiah pieces. Our family is very grateful for people like you who include this music that for us, brings an unmistakable spiritual presence which is the true Spirit of Christmas. My niece was in the choir and she said she and her fellow singers were so pumped and inspired! Thank goodness for people like you who share their time and talents with the community so voluntarily! You make the world a better place. It was nice to finally meet you. I had a wonderful time. You're so enthusiastic, and inspiring, flamboyant and entertaining. It's nice to see someone who values our American history, and our veterans, the importance of community, making good music, involving all ages and inspiring youth. You're easy to follow, and have a clear conducting style. I hope I was able to make a contribution to the overall sound of the viola section. When I joined the orchestra many years ago, I carpooled with a few people from the Beaverton area. Not only did it help financially, but it also was much safer to travel with other people. But, as time went on, I grew to enjoy the orchestra so much that even when my schedule didn't allow me to carpool, I continued to join the orchestra whenever I could and drove alone. The concerts have always been well attended and supported, and I believe that the community isn't quite aware of how lucky they are. The musical programming is so fresh and new. 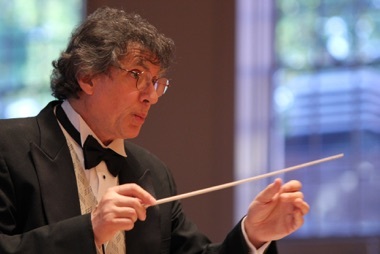 While I play principal second violin for the Beaverton Symphony Orchestra, I have also participated in the Jewish Community Orchestra and other area groups as well. Nobody has been able to touch this kind of creative programming -- the themes that tie the pieces together and new music that I have never played before (traditional and modern). After all of the performing I have done, I have never seen an audience applause so heartily and stand in ovation so quickly. The beauty in the programming has made it so that I, as a performer, usually participate in groups because I simply love music. The one thing that is so different about the North Oregon Coast Symphony is that they do something differently; they are there to bring music that they love to the audience. The music is to the audience, for the audience, and about the audience. I work in the music industry in the Portland area, and my boss is a viola player for the Portland Opera. He goes because he gets a check when he performs. When I tell him that I need to leave work early to make it to a rehearsal or performance at the beach, he always asks how much I am getting paid for this performance. He doesn't understand being emotionally bound to the music and to the people who come together to perform it. Sometimes, his comments eat at me as I sit in Portland traffic trying to get through the tunnel on Highway 26. I stew and beat the options in my mind off and on during the drive. But, the moment I get through the door everyone has been nothing but nice, thankful, and inviting to me. I have made many wonderful friends, and I quickly remember the reason why I am there. The small allowances have been so helpful whenever I have performed. I am a single mother of four daughters who are all musical as well. I could not participate without this kind of help to drive to rehearsals and performances. Another thing that makes NOCS stand out is the participation of young orchestra members who are students in the school system. The mentorship they receive is invaluable, and their youth and vitality bring a level of energy to the orchestra that I haven't seen anywhere else. If you have a successor here, he will have some big shoes to fill. I want you to know how much I appreciate your efforts on our behalf - I have never known a musical director who worked as hard, with such passion, and with such a generous spirit. You provided me the inspiration and context to grow as a player, for which I am deeply grateful. Thank you so much. You will be missed - I hope we meet again on our musical journey. I joined the symphony to play the harp. I stayed for 8 years because of Collin Heade. Very few are as supportive, enthusiastic, dedicated, committed or understanding as Collin. I have played under a few batons over the years, and have discovered that it is not worth the upset to play under an ill-tempered or arrogant conductor. I quit one orchestra because of one of those conductors: I did not gossip or natter about the man, I just exercised my right to not have to be there. That being said, the symphony is not a democracy, it is a dictatorship, and with Collin it was a benevolent one. He chose music that we had requested when possible, he chose music that would incorporate as many of the musicians as possible (a big plus for a harpist), he arranged rehearsals so that the instruments that were only needed for a few pieces could either come late or leave early (much appreciated, Collin!) and so many times when things got difficult he found a positive or constructive thing to say rather than an unkind response. The music was not always easy, but always beautiful. He challenged us and we got better. I am not sure of my status as of this moment, but like Donna, I have questioned my continued participation and considered leaving the symphony. But I have the summer to consider this. Collin, kudos and cartloads of flowers are not enough to thank you. Wish you nothing but the best. I will miss you. Congratulations on another crowd-pleasing performance by all of you. Conductor Heade was his usual humorous, interesting and talented self, providing such an array of physical visual effects to follow during each composition. And the choice of music! Wow, not the usual pieces you know by heart but rather the kind demanding attention to nuance and evoking a sense of anticipation that keeps one focused. Collin, I will miss you greatly. I have to tell you that I have never worked with a conductor who was as supportive, inspiring and encouraging to the orchestra members as you have been. Nor have I worked with a conductor who put so much of his/her heart and soul into the music and the group as you have. You always were supportive to the musicians and constructive in your suggestions. 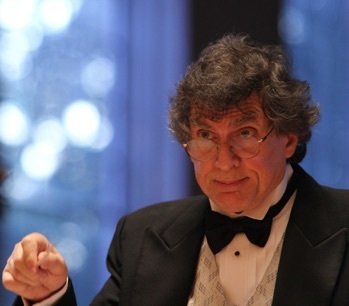 I have been playing in orchestras - both professional and non-professional for over 30 years and I don't think I have ever worked with a conductor as supportive, patient, and kind in his dealings with the orchestra members as you have been. I also want to thank you for your support and encouragement to my son Johnny. Playing with you and NOCS was an amazing experience for him and one that we both were looking forward to doing again. I am not sure what we will do at this point. I wish you all the best in your future studies. It would be wonderful to play music together again sometime - maybe some cello and flute pieces. Hopefully our paths will cross again and if you ever need a flutist for anything you are doing, please call on me! For several seasons I have attended performances of the Oregon Chamber Players and enjoyed the concerts, especially the strings. The cellos have been my favorite instruments in every piece. A few months ago I decided to take up the cello and sought out references for an instructor; I spoke with the most favorably mentioned instructor and made arrangements to begin lessons. 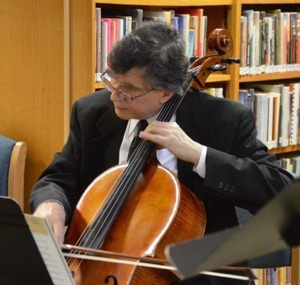 It took me several weeks of lessons to realize that the cello player whose music was a factor in my decision to take up the instrument is my very pleasant, patient and excellent teacher. 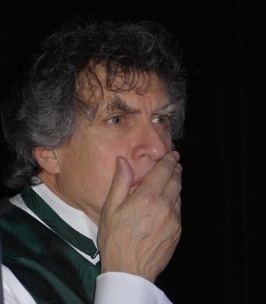 My beginner's anxiety and my tendency to forget names, coupled with the fact that it simply never occurred to me that a musician of his caliber might actually teach middle-aged beginners, explains my failure to recognize him as the performer whose music I have enjoyed on several occasions over the past few years. I had always had a love of music and a deep fondness for the beauty of the cello, but at 44 years old, I had real trepidation at the prospect of taking on a project such as "learning" the cello (the quotation marks are there because learning is a process and never completed!) I had every reason to be apprehensive. The cello is a difficult instrument to study. I believe that finding a professional instructor is the most important task for a beginning musician. I began lessons with Collin in December of 2000, and have remained his student since then. Collin truly has the heart and soul of a musician, has accomplished so much musically himself and yet possesses such high respect and regard for his students and their unique learning styles and abilities. He truly nurtures each student at their level while challenging their capabilities. His patience is extraordinary, his methods innovative, and I feel he honors the goals I set for myself as a musician who is just beginning to find my own voice. Learning has been a joyful experience and I'm grateful to Collin for his technical abilities, his kind and caring personality, and his sharing of his talents with his students.